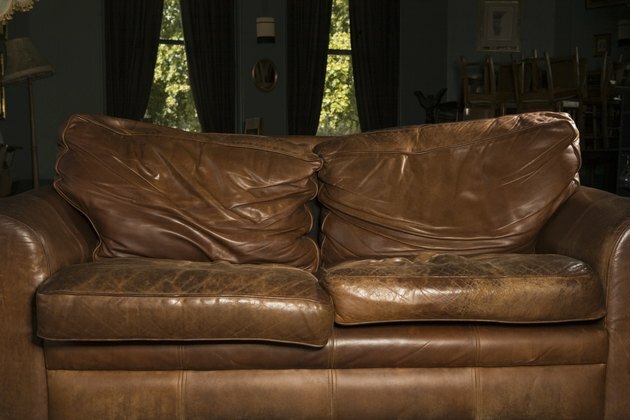 Sagging cushions on a sofa will make it look old and tired, and it will become increasingly uncomfortable. Replacing the filler in the cushions is an effective way to rejuvenate the piece. Cushions that are attached to the frame, called semi-attached cushions by the upholstery industry, can present the DIY-er with a problem if she doesn't know an upholsterer's secret: unless the cushions are tufted, there is a simple way into these cushions. The advanced home-sewer can then approach this project with confidence that the end result will be as she envisions. Getting into the attached cushions is the first step in rejuvenating the sofa. Remove the seat cushions from the sofa. Measure the side-to-side distance, or width, of each cushion. Measure the top-to-bottom distance, or length. Measure the depth, or thickness, of each cushion. Record these measurements. Run your hands along the bottom of the attached cushion to locate the zipper opening. Every cushion must have a way for the upholsterer to insert the filler, typically this is a zipper closure in the bottom seam of the cushion. It may have a hook and loop tape closure, or the seam may be hand-stitched. Open just enough of the seam to reach into the cushion to determine the type of filler. If the filler is one piece, or enclosed in a fabric bag, continue opening the seam and remove it. If the filler is loose, as foam chips may be, place a wide-mouthed bag under the seam and continue opening it, catching the loose filler in the bag. Sew a new bag for filler. Cut the fabric for this bag as wide as the cushion, plus the depth, plus 1 inch for seams. Cut the length as long as the cushion, plus the depth, plus 1 inch. With right sides together, sew all around the perimeter of the bag with a 1/2-inch seam, leaving a 6-inch opening for inserting the filler. Tie cording around each corner to create the depth of the cushion. Gather one corner into your hand, the tip of the corner pointed up and wind a piece of cord around the gathered corner, down from the tip of the corner at a spot that is equal to half the depth of the cushion. Tie securely. Turn the bag right side out. Fill the cover with new filler to the desired fullness. Weigh each cushion to ensure equal fullness. Stitch the opening closed. Insert the new fillers into the attached cushions and close the seam.